Wheat Design Group is excited about all of the bicycle and pedestrian advocacy in Tucson recently. Cyclovia and El Tour de Tucson both happened in the last couple of months, bringing out thousands of riders and enthusiasts. The World Day of Remembrance for Victims of Traffic Violence also happened a few weeks ago, and local organization Living Streets Alliance and their partners held a memorable vigil for the lives lost in Tucson due to traffic violence. A large part of our work here at WDG is transportation, and we are always looking to improve the ways pedestrians and cyclists safely use transportation routes. We are happy to see organizations in Tucson also on board with this vision. An exciting new bicycle program also just came to Tucson, and to our office's neighborhood in Sam Hughes: TUGO Bike Share! Municipalities across the world have embraced bicycle share programs, and Tucson is now part of that group of cities that support alternative transportation. TUGO currently has 36 stations across Tucson and offers daily, monthly, and annual passes. We're thrilled to have a station at our office - what a great way to take a lunch break, commute to a meeting, or get to and from work. Our staff member Alex attended the ribbon cutting ceremony for TUGO and brought the inaugural bike to our office's nearest station at 6th St and Tucson Blvd (see photos above from the launch - volunteers were the first ones to ride the bikes to various stations). Visit tugobikeshare.com to learn more about the program. Don't forget your helmet! The genus Salvia is a favorite around our office. Salvias are known for their attractive flowers, which are typically red or purple, and they often are hummingbird and butterfly magnets. There are a number of Salvias that perform well in our desert conditions. One of the Salvias in bloom this month is Salvia leucantha, Mexican Bush Sage, as seen in the photos below. Mexican Bush sage is native to central and eastern Mexico. It can tolerate full sun, but in our experience performs better in filtered or part shade. This plant can survive on a low water regimen, but looks best with moderate water. Cut it back to the ground after the last of the winter freezes to remove frost damage. A lovely garden with Mexican Bush Sage on the left. Also featured are a couple specieis of Agave, a hybrid Aloe, and Tecoma stans. At WDG, we value service to our community and our profession. This weekend our designer Nate had the opportunity to teach a group of at-risk youth about Landscape Architecture and the design process at a program called YARDS. YARDS provides vocational training in desert landscape and maintenance for youth at risk involved in the Pima County Juvenile Court System. The students learn a range of skills, including Tools and Safety, Desert Plant ID, Soils, Water and Plants, Water Harvesting, Pruning Techniques, Irrigation Systems and more. Nate introduced the group to the profession of Landscape Architecture and the design process. The students got an opportunity to re-design a parking lot and turn it into their ideal backyard. Check out some of the student's very creative designs below! A lot of sports in this backyard. Looks great! Great spot for a spa. Snack shop, DJ booth, and a charging station? I'm in! Nate teaching about final design graphics. A very nice flower garden. Could be some future Landscape Architects in this group! What’s that rotting flesh smell you ask? It’s the flower of a Stapelia plant of course! August and September are flowering season for Stapelias, and if you’re lucky enough, you’ll get to catch a Stapelia in bloom, and better yet, get to experience it’s pungent smell. Stapelia is the genus of over 50 different species of this succulent plant that has spineless, clump-forming stems. Stems are toothed, have four angles, and branch from the base into a larger mass. Stapelia flowers are red, purple, or yellow, and can get up to 18” in diameter (Stapelia gigantea has the largest flower). Flowers can be polished or hairy, and there are only two species of Stapelia that are pleasantly scented. The four-sided geometric stems of the Stapelia plant. Stapelias make great container plants as long as soil remains well-drained. They can handle full sun, but will be happier in an area that receives light shade. The geometric stems of Stapelias bring interesting structure and texture to gardens, and the stinky starfish-like flowers that emerge during bloom season are an added bonus. Stapelia flowers just before they bloom. A large WDG project, Downtown Links, is nearing construction! The Tucson Daily Star has a good overview of the project in today’s paper (link below). For those of you looking for alternate routes around downtown, a solution is near. Downtown links will connect Aviation Parkway to the I-10 via St. Mary’s Rd. WDG has been a part of the downtown links project for many years and is looking forward to the construction of the largest phase of the project. WDG is especially excited about the deck plaza, a small park that will be built on 9th Ave, over 6th St. This will be the first deck park in Tucson! Some readers may be familiar with the deck park in Phoenix, which is on top of the Papago Freeway Tunnel. Our deck park will be much smaller, but is also an innovative use of space above existing infrastructure. Stay tuned for more updates during the construction process. It’s always exciting to hear about our projects being fully realized and constructed, which happened this week with the announcement of the Giss Parkway Interchange at Interstate 8. The project is Yuma’s first modern roundabout for a freeway interchange, which is replacing a T intersection for the on- and off-ramps from westbound I-8. Improvements include lighting, signage, drainage, and bicycle accessibility. Wheat Design Group provided the erosion control plans and the aesthetic design for the roundabout. WDG was excited to be part of a project that will provide Yuma with a more effective and safe traffic solution between Giss Parkway and I-8. For more information, read the ADOT story here. Can YOU guess the Plant of the Month? UPDATE: The answer is Firecracker Bush, Bouvardia ternifolia. See you back here next month for September’s Plant of the Month! This month we’re changing things up a bit, and we want YOU to guess the Plant of the Month for August! If you’ve been out in the rocky upland areas around Tucson lately, especially Madera Canyon, you most likely spotted this plant. This attractive species is a great addition to native plant gardens, and will be sure to attract hungry pollinators. Our Plant of the Month blooms between April and October, and the flower is tubular, bright red, and very showy. Flowers grow in clusters, and each blossom splits into tiny lobes. 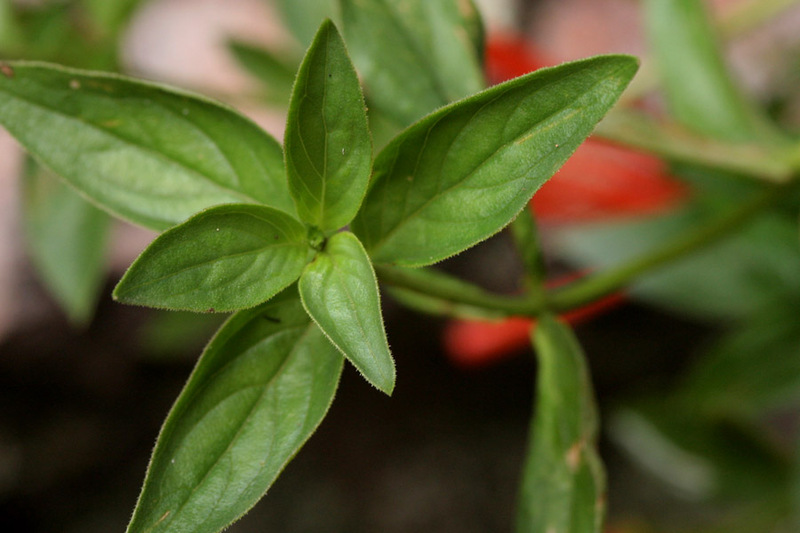 The entire plant generally grows to three feet tall and prefers partial shade. Leaves are lance-shaped and can be up to three inches in length. If you touched a leaf, you’d feel tiny soft hairs. We are not the only ones who love this plant; hummingbirds, butterflies, and moths eagerly pollinate this plant when it’s in bloom. Some species that love feasting on its nectar include the Cloudless Sulphur and Southern Dogface butterflies, and the Falcon Sphinx moth. Do YOU have a guess for our Plant of the Month? Leave your answer on our Facebook page! The photos above and below were taken in Armory Park, near downtown, by our very surprised designer, Nate. In any case, get out there and remove those weeds! Wow! Check out this double crested Saguaro that we saw while completing a Native Plant Inventory on Aerospace Parkway! Aerospace Parkway is getting improvements to accommodate the economic development in the area. This project will move quickly, so keep an eye out for a widened road and landscape improvements in this area, such as plants and signage. Good news: The double crested Saguaro is well outside of the construction area and will remain in its current location. Keep scrolling to see more photos we took during our Native Plant Inventory. Alex carefully searching for cactus. Lots of Creosote and Mesquite on site. We have had a great few weeks of monsoon rains and it seems like all of our plants are in bloom! Texas Rangers, Fairy Dusters, and Little Leaf Cordias are providing a rainbow of colorful flowers in our rain-soaked desert while succulents and cactus are absorbing as much water as possible to put on new growth. Seedlings and wildflowers are sprouting anywhere there is bare ground. Hummingbirds, bees and butterflies have all returned. It’s a great time to be a plant (and person) in the Sonoran Desert! While we could choose a number of plants that look great during this time of year, this month we are focusing on the Indian Mallow – Abutilon palmeri. The Indian Mallow is native to the Southwestern United States and can be planted in full and reflected sun environments. It has soft, fuzzy leaves that are relatively large for desert plants, and its flowers are bright yellow and showy. This is a great plant to put in your rainwater harvesting basin and is a quick grower. Indian Mallow is available at many nurseries in the Tucson area, so plant one now to take full advantage of our humidity and moisture during the monsoon season! The wait is over- the monsoons are here! It’s been a great first week of monsoons here in the Tucson Basin. Monday evening brought the first long-awaited storm, which delivered over 1″ of rainwater in some parts of the metro area. Even after a few days of rain, the desert already looks more alive. Young seedlings are emerging from saturated ground, families of quail are running cheerfully, and Tucsonans are taking to their patios to enjoy the downpours. Everyone is happy. Monday evening’s clouds bringing the first summer monsoon rains of 2017. The monsoons are a special part of the life processes here in Tucson. The importance of the storms is evident in our landscapes and specifically through the way we’ve learned to harvest rainwater. Landscapes are graded to create basins, swales, and berms to direct the flow of water and slow infiltration rates. Through simple earthworks, we are able to keep water in places where it’s most needed, such as areas planted with trees and shrubs. Take a drive through any Tucson neighborhood and you’ll see homeowners championing rainwater harvesting techniques in their yards. Here’s an example of a curb cut that allows much-need water to flow into a landscape rather than a storm drain. A basin captures rainwater from the surrounding landscape, which is enjoyed by these trees and shrubs. The more rainwater we are able to use, the less we have to rely on irrigation. Why do Tucsonans care so much? We only get monsoon rains twice a year, and in a desert climate, any chance to maximize water from the sky is a valuable opportunity. The City of Tucson and Tucson Water are also on board, and offer a rainwater harvesting rebate and a grant/loan for limited income families. Through an application process and a one-time workshop, residents can be reimbursed for a portion of the costs associated with implementing a rainwater harvesting system. We are lucky to live in a city where our water utility supports water conservation. A homeowner’s water harvesting basin, supported by the City of Tucson and Tucson Water. Rainwater harvesting is an integral part of design here at Wheat Design Group. Whether it’s a roadway project or a residential landscape, we actively design with the intention of harvesting rainwater and creating desert-appropriate spaces. Grading for water harvesting creates varied and interesting landscapes that become both beautiful and functional. When the monsoons arrive, we are able to celebrate the thought we’ve put into our sustainable designs. Curb cut and basin at work during a monsoon rain on Scott Avenue. Our May plant of the month is Leucophyllum langmaniae ‘Lynn’s Legacy’, Lynn’s Legacy Everblooming Sage. This is closely related to the commonly used Texas Rangers, but has the advantage of more flowers! Other Texas Rangers bloom only when the humidity is high, during monsoons and other rain events, while Lynn’s Legacy will bloom throughout the warm period. The flowers are lavender and the leaves are grey-green. This can grow to be a large shrub (5’x5′) and can tolerate full sun conditions. Most nursery’s in Tucson carry this varietal and you’d be wise to add one or two of these to your garden! Check out this great list of landscape architecture books by Land8! Lots of good reads to keep you occupied for the next few months. Chaparral sage is in full bloom this time of year. This Salvia has beautiful violet-blue flowers and is very fragrant when touched. The leaves are silver-blue and the plant is attractive even when it is not in bloom. Chaparral sage can reach 5’x5′, although some cultivars are smaller. Copyright ©2019 Wheat Design Group, Inc. All rights reserved.